Visitors to the Sherwood Island pavilion know Claudia Schattman’s artwork. Now her many fans can do more than admire her next project. They can donate funds — not to her “tree” mosaic-in-the-making, but to help plant them. Friends of Sherwood Island is sponsoring a “100 Trees for 100 Years” drive. The goal is to help purchase trees, shrubs and grasses to replace the dozens of mature trees lost to Hurricanes Irene and Sandy, and mitigate significant habitat loss. The mosaic is a collection of plates, teapots, stained glass and knickknacks Schattman collected at tag sales, flea markets, even local beaches. Donor names will be placed around the perimeter (minimum donation: $275). To donate, click here. This entry was posted in Arts, Environment, People and tagged Claudia Schattman, Friends of Sherwood Island. Bookmark the permalink. 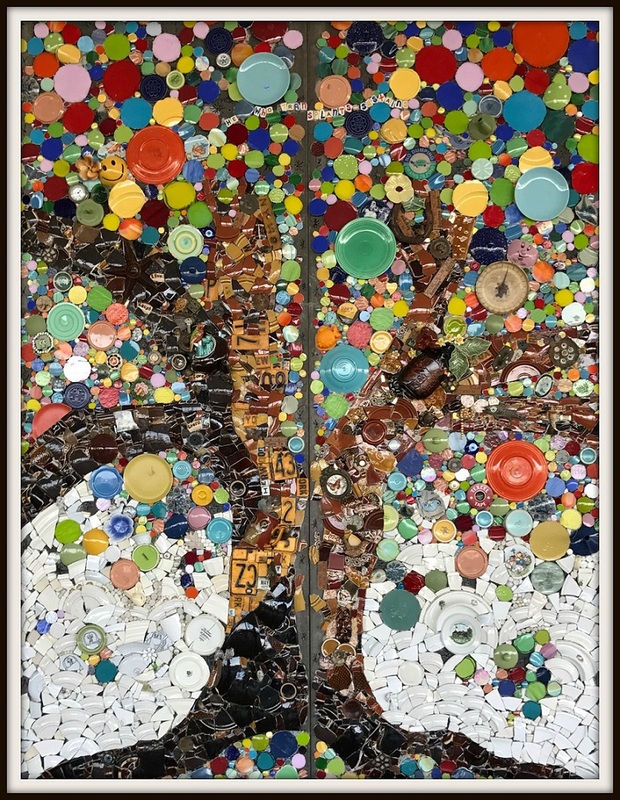 The Friends of Sherwood Island State Park greatly appreciate your showcasing Mosaic Artist Claudia Schattman ‘s new installation of a Mosaic Tree on the wall of Sherwood Island’s Pavilion! It is there to commemorate in a variety of ways as described at https://06880danwoog.com/2017/10/03/1-mosaic-100-trees/ ALL donations (no minimum) to its “100 Trees for 100 Years ” campaign to replace and replenish shrubs, trees and habitat devastated by Sandy, Irma and other recent storms will be reflected in some way. The particulars will be on our website soon. No better time than the present for people to walk in Westport’s 230 plus acres of glorious coastal green space on Sherwood Island to view Claudia Schatmann’s magnificent whimsical Tree on the Pavilion’s wall . HOORAY For You! I LOVE this TREE, Claudia!! I bet there are many folks with interesting pieces of brik-a-brac they’d contribute and hope to find worked in to future installations?? Anyway– BRAVO nad Thank YOU for this gorgeous piece!